Sainsbury's will have more convenience stores than supermarkets this year. Tesco already has more than 1,600 branches of Tesco Express. Once threatened with extinction, the mini-supermarket is on the march. Sixty years ago the local grocery store was at the heart of the high street. Greengrocers were the gatekeepers to breakfast, lunch and dinner, as shoppers queued to order items from assistants behind counters. Then the advent of the self-service store - where customers collected their own groceries in baskets - changed the way the nation shopped. Sainsbury's opened its first self-service store in Croydon, Surrey, in 1950 - and the format spread to High Streets across the country. These early supermarkets were fundamentally not too dissimilar to the convenience stores of today. They were found on high streets and customers didn't have to drive to the edge of a city to find them. But it was the larger out-of-town supermarkets that came a decade later that really changed British retailing. With their plethora of low-cost produce, the warehouse-like retail units which soon came to dominate the modern landscape were born. They were widely criticised for squeezing independent traders and crushing retail diversity. Once-familiar convenience chains like Premier, Victor Value and Fine Fare - which had 200 outlets by 1962 - fell by the wayside in their wake. But now the local convenience store - typically under 3,000 sq ft (280 sq m) and not affected by Sunday Trading Act - seems to be having a resurgence, albeit driven by the big chains that flourished with out-of-town hypermarkets. Last week, Sainsbury's - which opened its first Local store 15 years ago - said convenience stores will overtake its number of supermarkets this year. The retailer is currently opening two convenience stores each week. Tesco, which has more than 3,000 stores, already has more convenience stores than supermarkets, boasting more than 1,600 Tesco Express outlets alone. 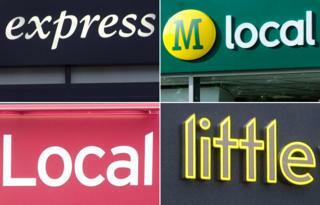 Meanwhile, Morrisons has opened 85 of its M Local stores since launching them in 2011. The chain hopes to open a further 100 in its next financial year. Industry body IGD says the value of the convenience sector will grow from £35.6bn in 2013 to £46.2bn by 2018. So why is the mini-supermarket making a comeback? David Gray, a retail analyst at Planet Retail, says the focus on smaller formats is a reflection of changing shopping patterns. "People are increasingly doing one big shop - in store or online - every week or fortnight, and then topping up at convenience stores," he says. The nation's demographics are also altering demand. "There's an ageing population - older people tend to like shops close by - and more single households, who often buy little and often," he says. Paul Langston, consulting partner of location strategy at market research analysts CACI, agrees the proliferation is down to consumer trends. He cites the rise of click and collect - where shoppers order online and pick up at a local store - as another factor. At the same time, the availability of town centre sites at lower rents has appealed to companies. Morrisons snapped up Jessop, HMV and Blockbuster stores when they went bust. Aldi bought a former Peacocks store on Kilburn High Road, north-west London, to create a store half their normal size. "Having a top up store in the shadow of a main store is incredibly logical," says Langston. Number of convenience stores in the UK at end 2013 according to retailers' own figures. The move towards mini-supermarkets has also enabled companies to micro-market. Convenience stores typically have a catchment area of about half a mile, according to Langston, so stores near work place areas might stock more grab and go, while those with a high single population might opt for more microwave meals. But it isn't all good news for shoppers. Convenience stores can also be more expensive. "Tesco Express and Sainsbury's Local tend to be about 3% more expensive - they adjust ranges so there isn't so much economy, it's mostly mid-tier and premium products," says Gray. "Waitrose charges more at convenience stores too, but then there is a higher cost of operating - smaller stores have smaller stock rooms and need more frequent deliveries." There's also the issue of pushing small independents out. The Association of Convenience Stores says it is tough to compete with the big players, but good independents can survive, and even thrive, by playing on their strengths, such as customer service and a much deeper knowledge of the community. But for Jack Patel, 55, who has owned Westholme Stores in Goring-on-Thames, Oxfordshire, for 26 years, the prospect of a Tesco Express coming to the village is "really depressing". "There's only so much trade in the village. I think it would take about 40% or 50% of my business away, it would be very difficult for us to survive. There's no way I can compete with Tesco prices," he says. Residents of the chocolate box village on the bank of the River Thames are also up in arms. Tesco occupies a unique place in British retail, visited by millions but controversial to many. It all started with a barrow selling fish paste, says Denise Winterman. The 300th Waitrose has opened in Helensburgh, near Glasgow. Is getting a Waitrose in your neighbourhood the ultimate badge of endorsement, asks Kathryn Westcott. Nearly five decades have passed since the UK's first out-of-town superstore opened its doors. It differed starkly from the outlets used by millions today, but it helped change British shopping forever, says Jon Kelly - of the shop we now know as Asda. "The opposition is virtually unanimous. The village's population is about 3,100, and we already have 1,600 signatures petitioning it," says Emrhys Barrell, a 65-year-old resident. "It would destroy the heart of the village. This isn't just people waving flags, they've got to understand the depth of feeling," he says. On the flip side, Langston says in some places retailers benefit from the footfall that convenience stores provide. But with supermarkets increasingly focusing on smaller stores, what does this mean for their bigger outlets? Talk of the death of the hypermarket is misplaced, says Gray. "They are the biggest chunk of the market and will always dwarf smaller outlets, while only a certain percentage of the market will go online," he says. The supermarket and hypermarket was worth £74.1bn in the year ending in April 2013, and is projected to be worth £80.1bn in April 2018, according to IGD. Meanwhile, online market was valued at £6.5m and is expected to be worth £14.6bn by 2018. Supermarket bosses seem to think the future is multichannel growth - combining big stores, local convenience stores and online. Last year Tesco CEO Philip Clarke said changes in technology would continue to drive change. "The last five years have shown that change in retail can be disruptive and come in sharp steps, not a steady trend," he said. They are also giving people more choice. "Customers are getting more and more promiscuous," muses Langton.